Three minutes. According to the National Institute of Standards and Technology (NIST), that’s how much time families have to escape a newly built home – as opposed to 17 minutes in older homes with stronger trusses and more interior walls that help to contain fires. The sobering reality is that the most dangerous place to be, in terms of fire safety, is at home. Here in Minnesota, 257 people have died in home fires over the past 10 years. And most often the victims of fire are the younger and older among us, who have a more difficult time getting out in an emergency situation. The good news is that there is a solution, well tested and proven: A combination of having working smoke alarms and fire sprinklers in place along with a practiced emergency exit strategy is nearly 100-percent effective in saving lives. Nationwide, firefighters have been working to add a residential sprinkler requirement to the building codes, but there has been an organized effort fighting us every single step of the way. Opponents claim that today’s homes are completely safe and that smoke alarms are sufficient to notify people in time to exit safely. As firefighters, we know that’s simply not true. Smoke alarms are not enough. And the often difficult-to-hear facts bear that out. A NIST study found that homes equipped with smoke alarms and a fire sprinkler system experienced 100-percent fewer civilian fatalities and 57-percent fewer civilian injuries than homes equipped with only smoke alarms. Modern residential fire sprinklers have a temperature-sensitive element that causes a single sprinkler (rather than the entire system) to activate when temperatures reach 135 degrees to 165 degrees Fahrenheit. Sprinklers only operate in response to the heat of fire; they do not respond to smoke or vapors. Because sprinklers operate individually, only the sprinkler(s) over the fire will activate. While they are primarily intended to control the fire long enough to allow occupants to escape, they often help reduce the extent of damage and property loss. When a fire starts, the heat from the fire activates the sprinkler closest to the fire, limiting fire growth. In some instances sprinklers will actually put out the fire before fire fighters arrive. By limiting or stopping fire growth, further property damage, including damage that could be caused by streams of high-pressure water from fire department hoses, also is prevented. After a multi-year battle, fire sprinklers may soon be added to Minnesota’s residential building code. When adopted, newly constructed, one- and two-family homes 4,500 square feet and larger will be required to install a fire sprinkler system. Please join the Minnesota Fire Association Coalition and call your state legislator to support the rulemaking process, to reject any attempt to block it with legislation and to allow the new, safer construction of homes to be a minimum requirement so we can begin to put a stop to the senseless deaths that take place right in our own homes. Residential fire sprinklers save lives. Smoke detectors are not enough. Sprinkler systems provide additional benefits, on top of the benefits already provided by smoke alarms. While working smoke alarms cut the risk of dying in a reported home fire by about 50 percent, the risk of dying decreases by about 80 percent when sprinklers are present. Fire sprinklers are cost-effective. A national perspective on the cost of installing residential fire sprinklers is examined in the report, Home Fire Sprinkler Cost Assessment, released by the Fire Protection Research Foundation, an affiliate of NFPA. According to the report, the cost of installing sprinkler systems averages $1.35 per sprinklered square foot. 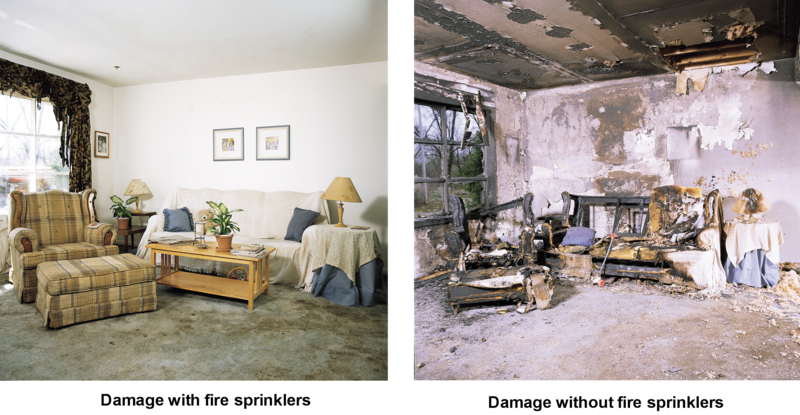 The personal stories told through the Faces of Fire campaign share first-hand experiences of those who escaped or lost loved ones in home fires and those whose lives and property were protected by residential fire sprinklers.